Katharo, Crete, Greece Lat 35.147805678,Lon 25.5652713776; dew pond on an agricultural plateau where no artificial fertilizers are used. 19 Sep 2016. Steve Daniels. © Steve Daniels (daniels@hotmail.gr). 400x __Dim. 11 x 78 µm. 24 Aug 2011. Robert Lavigne. 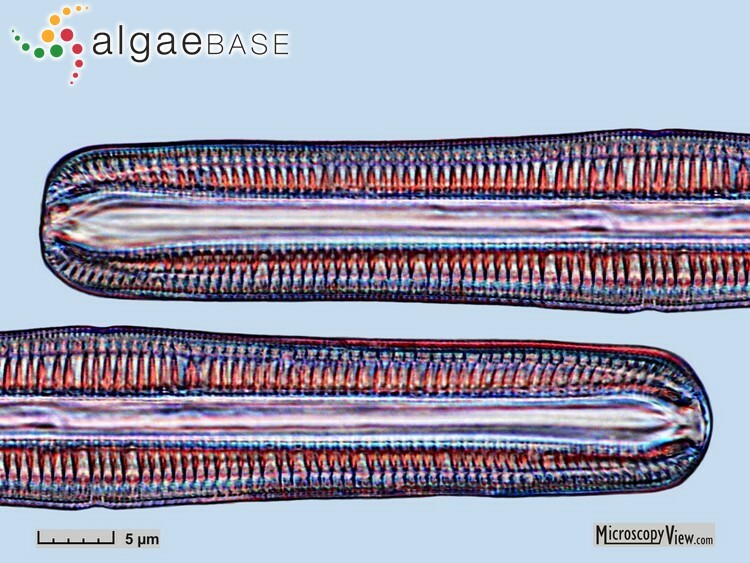 © Robert Lavigne (MicroscopyView.com). Close-up __FOV: 50 µm. 24 Aug 2011. Robert Lavigne. 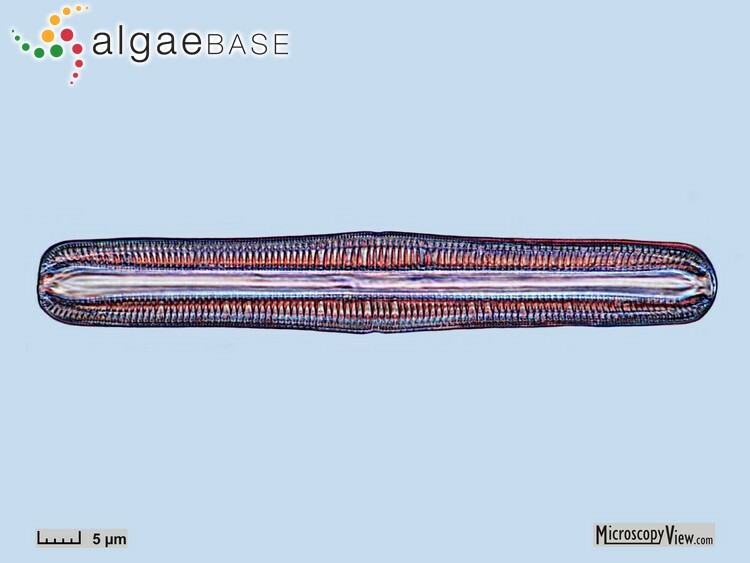 © Robert Lavigne (MicroscopyView.com). 600x __Dim. 12 x 81 µm. 24 Aug 2011. Robert Lavigne. © Robert Lavigne (MicroscopyView.com). 600x __Dim. 18 x 105 µm. 24 Aug 2011. Robert Lavigne. 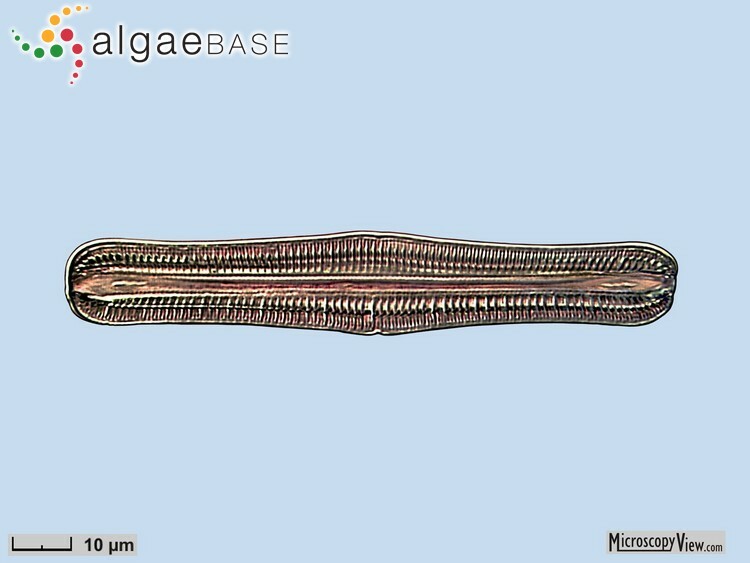 © Robert Lavigne (MicroscopyView.com). Renton, Washington, USA; golf course, 400x, DIC. 14 Sep 2008. Karl Bruun. © Karl Bruun (skogenman@earthlink.net). Seattle, Washington, USA; ship canal, 1000x, DIC. 10 Apr 2008. Karl Bruun. © Karl Bruun (skogenman@earthlink.net). Published in: Müller, [G.F.] O. (1895). Rhopalodia ein neues Genus der Bacillariaceen. Botanische Jahrbucher fur Systematik, Pflanzengeschichte und Pflanzengeographie 22: 54-71, 2 pl. This is the type species (holotype) of the genus Rhopalodia. 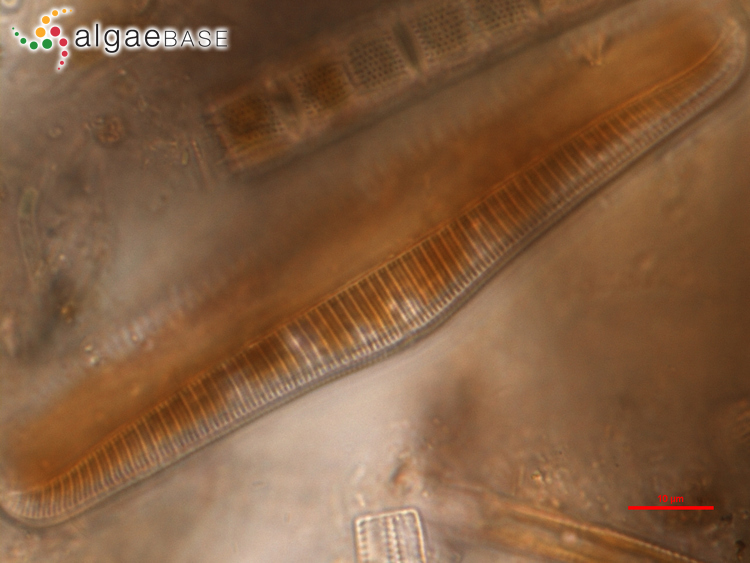 Lectotype locality: "Sibirien", “bei Orenburg" [Russia] (Jahn & Kusber 2004: 586). Notes: Lectotype (designated by Jahn & Kusber 2004): "[icon] cell on the upper row on the right hand side on the glued paper (upper row, center) “Navicula gibba, Orenburg 1/12-1/10'''” on drawing sheet No. 560a in BHUPM (see arrow in Fig. 51)." (Latin), noun (hump); adjective (humped) (Stearn 1973). Cocquyt, C., Kusber, W.-H. & Jahn, R. (2018). Epithemia hirudiniformis and related taxa within the subgenus Rhopalodiella subg. nov. in comparison to Epithemia subg. Rhpalodia stat nov. (Bacillariophyceae) from East Africa. Cryptogamie Algologie 39(1): 35-62. Jahn, R. & Kusber, W.H. (2004). 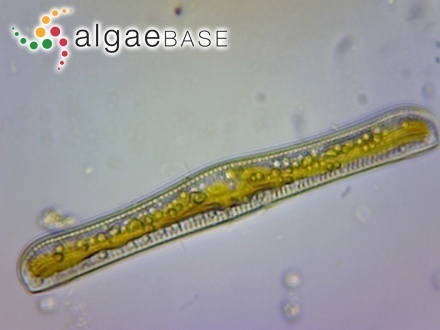 Algae of the Ehrenberg collection - 1. 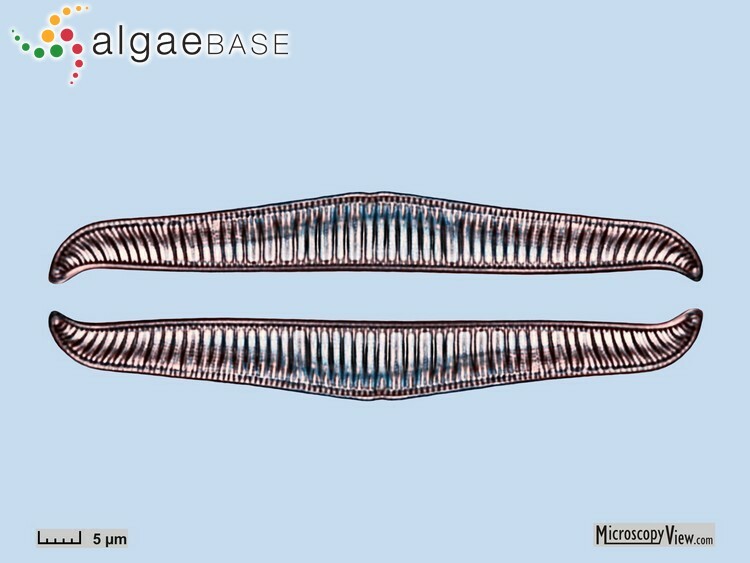 Typification of 32 names of diatom taxa described by C.G. Ehrenberg. Willdenowia 34(2): 577-595, 1 table. Miscoe, L.H., Johansen, J.R., Kociolek, J.P. & Lowe, R.L. (2016). 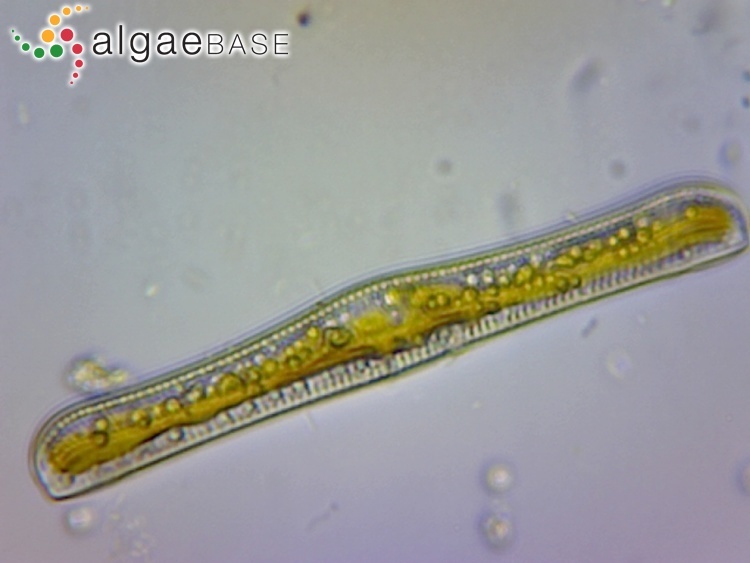 The diatom flora and cyobacteria from caves on Kauai, Hawaii. I. 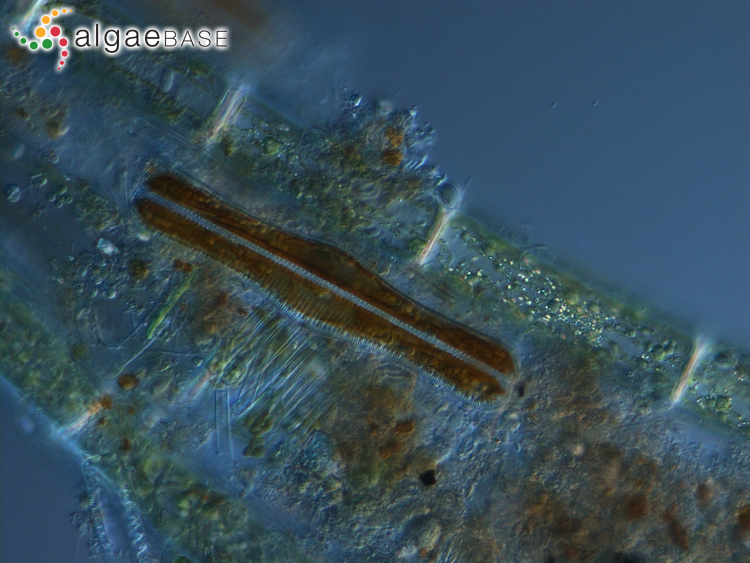 Investigation of the cave diatom flora of Kanuai, Hawaii: an emphasis on taxonomy and distribution. Bibliotheca Phycologica 123: 3-74. Accesses: This record has been accessed by users 7105 times since it was created. DeYoe, H.R., Lowe, R.L. & Marks, J.C. (1992). Effects of nitrogen and phosphorus on the endosymbiont load of Rhopalodia gibba and Epithemia turgida (Bacillariophyceae). Journal of Phycology 28: 773-777, 2 figs, 1 table.